Program #CHAA001. Recorded in San Francisco, CA on December 2, 2011. Among the many issues plaguing South Asia none is as violent and deeply contested as Kashmir. The major unresolved issue of the disastrous British partition of India in 1947, Kashmir has been the site of wars and the threat of wars, and probably the world’s longest and most extensive military occupation. India brooks no international meditation to address the problem. What’s the problem? A lot of Kashmiris don’t want to be part of India. They didn’t in 1947 and they don’t, probably in even larger numbers, today. The U.S., champion of human rights elsewhere, is keen to access a major growing market, thus says nothing of what India is doing in Kashmir. Its silence is becoming harder to maintain as now the earth is revealing dark deep secrets of Indian rule in Kashmir. The thousands of dead and missing are making noise. Angana Chatterji is a convener of the International People’s Tribunal on Kashmir. She has taught social and cultural anthropology for many years and has been working with social movements, local communities, and citizens groups in India and internationally. 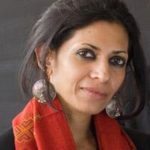 She is the author of Violent Gods and contributor to Kashmir The Case for Freedom. India may justify violence over Kashmiris by saying that losing Kashmir may damage national respect of India in the eyes of Indians and other countries especially Pakistan. Is it true? I am a naive as far as politics is concerned. But I and especially common must know what is national self esteem and self respect?